Peak Receive Performance: 137-170, 440-470 and 820-870 MHz. Analog or Digital. For receiving the commonly used Public Service frequencies plus Railroad, Marine, and Weather. This antenna was originally sold as the Centerfire Deluxe Discone. 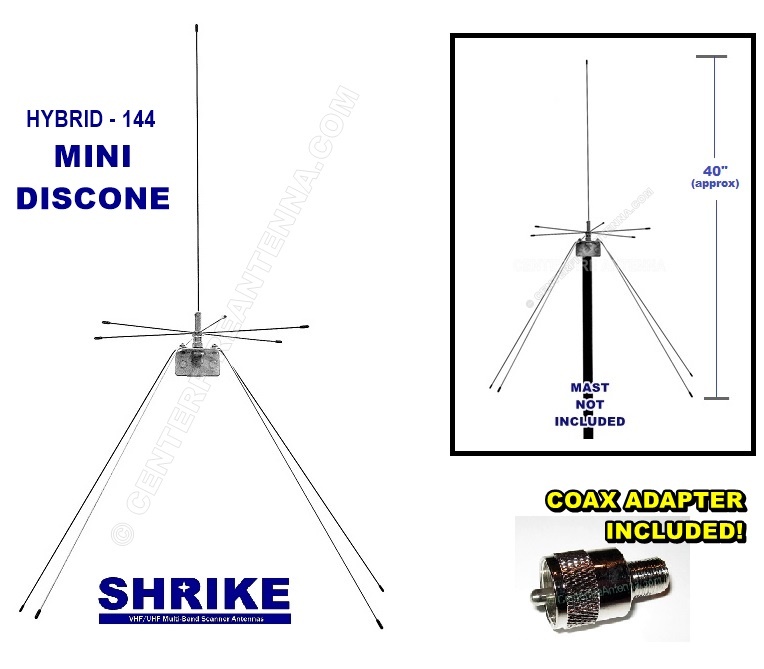 We have expanded our operations and are in the process of relabeling and moving all of our Multi-Band scanner antennas to our newest division, Shrike Antennas. Introduced in 2005, this antenna quickly became one of our best selling items. It’s used by radio enthusiasts, businesses, radio equipment manufacturers and installation techs around the world! Rugged All Weather aluminum and stainless steel construction. All radials are 3/32″ Stainless Spring Steel. SO-239 stud, F -type Cable Adapter included. Can use any 50 or 75 ohm coax cable. 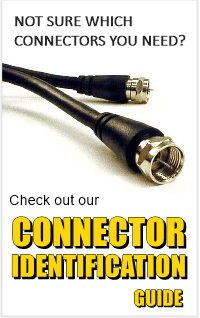 For best UHF scanning results we recommend using RG6 coax cable.. A Type “F” connector adaptor is included with this antenna. 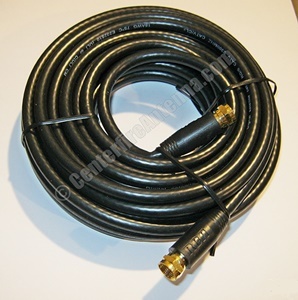 You can order your antenna with RG6 coax cable from the drop-down menu below. You will need to adapt the F-type coax cable to your scanner radio’s antenna connector… these adapters are available at the bottom of this page. A great antenna for use with Dual Band hand held radios! If your radio has extended receive you will enjoy the wideband capabilities of this antenna. The Centerfire Deluxe Discone can be tuned to an SWR below 1.5 on the 2 meter band and will also transmit on the 70cm band with an SWR below 2 between 440-448 MHz. 50 ohm coax cable is recommended for transmitting. Your 50 ohm cable will require a PL-259 connector to attach to this antenna. Yes, this antenna can also be tuned for transmitting on the MURS band! The perfect “single antenna” for those MURS users that may also want to monitor a scanner. Tuning the Deluxe Discone is simple and fast. Instructions and tuning wrench are included. 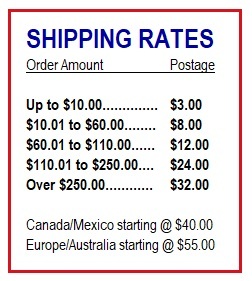 Save on shipping costs by adding these items to your order before you checkout.